This article is about the nuclide cobalt-60. For other uses, see Cobalt-60 (disambiguation). it is equal to 0.35 mSv/(GBq h) at one meter from the source. This allows calculation of the equivalent dose, which depends on distance and activity. reduces the distance to a few millimeters, and the same dose is achieved within seconds. Test sources, such as those used for school experiments, have an activity of <100 kBq . Devices for nondestructive material testing use sources with activities of 1 TBq and more.
. The main β-decay transitions are shown. The probability for population of the middle energy level of 2.1 MeV by β-decay is 0.0022%, with a maximum energy of 665.26 keV. Energy transfers between the three levels generate six different gamma-ray frequencies. In the diagram the two important ones are marked. Internal conversion energies are well below the main energy levels. teletherapy machines to treat cancer. Radiation source for industrial radiography. Radiation source for leveling devices and thickness gauges. Radiation source for pest insect sterilization. As a radiation source for food irradiation and blood irradiation.
. No nation is known to have done any serious development of this type of weapon. needle implanted in tumors for radiotherapy, around 1955.
teletherapy machine for cancer radiotherapy, early 1950s. source in the pipe, center. 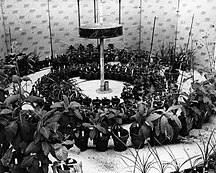 source for sterilizing screwflies in the 1959 Screwworm Eradication Program. , by substituting the stainless steel control rods with cobalt rods. In the United States, it is now being produced in a BWR at Hope Creek Nuclear Generating Station. The cobalt targets are substituted here for a small number of fuel assemblies. is excreted in feces. The remainder is taken up by tissues, mainly the liver, kidneys, and bones, where the prolonged exposure to gamma radiation can cause cancer. Over time, the absorbed cobalt is eliminated in urine. in scrap metal is responsible for the radioactivity found in several iron-based products. that had contaminated the steel. source was stored at an unsecured location in Bangkok, Thailand and then accidentally sold to scrap collectors. Unaware of the dangers, a junkyard employee dismantled the head and extracted the source, which remained unprotected for a period of days at the junkyard. Ten people, including the scrap collectors and workers at the junkyard, were exposed to high levels of radiation and became ill. Three of the junkyard workers subsequently died as a result of their exposure, which was estimated to be over 6 Gy. Afterward, the source was safely recovered by the Thai authorities. In December 2013, a truck carrying a disused 111 TBq 60Co teletherapy source from a hospital in Tijuana to a radioactive waste storage center was hijacked at a gas station near Mexico City. The truck was recovered shortly after, but it was discovered that the thieves had removed the source from its shielding. It was found abandoned and intact in a field close by. 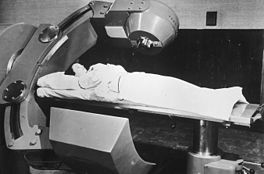 Despite early reports with lurid headlines asserting that the thieves were "likely doomed", the radiation sickness was mild enough that the suspects were quickly released to police custody, and no one is known to have died from the incident. In 1957, Chien-Shiung Wu et al. discovered the β-decay process violated parity, implying nature has a handedness. nuclei by cooling the source to low temperatures in a magnetic field. Wu's observation was that more β-rays were emitted in the opposite direction to the nuclear spin. This asymmetry violates parity conservation. Argentina, Canada and Russia are the largest suppliers of cobalt-60 in the world. ^ National Nuclear Data Center, Brookhaven. "Chart of Nucleids". Retrieved 2018-10-25. ^ a b "Nuclear Decay Data for Dosimetric Calculations". Annals of the ICRP. ICRP Publication 107. 38 (3). 2008. ^ "Table of Isotopes decay data". Retrieved April 16, 2012. ^ a b Gamma Irradiators For Radiation Processing (PDF). IAEA. 2005. ^ a b c d "Cobalt | Radiation Protection | US EPA". EPA. Retrieved April 16, 2012. ^ "Lessons Learned The Hard Way". IAEA Bulletin 47-2. International Atomic Energy Agency. Archived from the original on 18 July 2010. Retrieved 16 April 2010. ^ "Petco Recalls Some Stainless Steel Pet Bowls Due to Cobalt-60 Contamination". Retrieved 21 August 2012. ^ "Asos Belts Seized Over Radioactive Studs". Sky News. 2013-05-28. Retrieved 2013-12-05. ^ The Radiological Accident in Samut Prakarn (PDF). IAEA. 2002. Retrieved 2012-04-14. ^ "Truck with dangerous radioactive materials hijacked in Mexico - IAEA — RT News". RT. 2013-12-04. Retrieved 2013-12-05. ^ "Mexico Informs IAEA of Theft of Dangerous Radioactive Source". IAEA. Retrieved 2013-12-05. ^ a b "Mexico Says Stolen Radioactive Source Found in Field". IAEA. 2013-12-05. Retrieved 2013-12-05. ^ Will Grant (2013-12-05). "BBC News - Mexico radioactive material found, thieves' lives 'in danger'". BBC. Retrieved 2013-12-05. ^ Gabriela Martinez, and Joshua Partlow (6 December 2013). "Thieves who stole lethal radioactive cobalt-60 in Mexico likely doomed". Los Angeles Daily News. Retrieved 12 March 2015. ^ M. Alex Johnson (6 December 2013). "Six released from Mexican hospital but detained in theft of cobalt-60". NBC News. Retrieved 12 March 2015. ^ Mary Cuddehe (13 November 2014). "What Happens When A Truck Carrying Radioactive Material Gets Robbed In Mexico". BuzzFeed. Retrieved 12 March 2015. ^ Wu, C. S.; Ambler, E; Hayward, R. W.; Hoppes, D. D.; Hudson, R. P. (1957). "Experimental Test of Parity Conservation in Beta Decay". Physical Review. 105 (4): 1413–1415. Bibcode:1957PhRv..105.1413W. doi:10.1103/PhysRev.105.1413. ^ "The Canadian Ghost Town That Tesla Is Bringing Back to Life". Bloomberg.com. 2017-10-31. Retrieved 2018-05-22. Cobalt-60, Centers for Disease Control and Prevention. Beta decay of Cobalt-60, HyperPhysics, Georgia State University. Dr. Henry Kelly (March 6, 2002). "Cobalt-60 as a Dirty Bomb". Federation of American Scientists. Archived from the original on April 5, 2002.